I am SO excited to share this interview with you today! I've known Carl since I moved to Seattle in 2009. He has been hugely supportive of my journey in letterpress printing from early on. (Check out my story on Go Mighty for more about how Carl has so graciously helped us.) This past year, i've had the absolute pleasure of spending my Friday mornings with Carl (and his sweetie, Babs) at their home in West Seattle. I've loved every minute of my education in wood engraving and our chats about art and life. Today i'm pleased to share my friend with you! He's a master wood engraver, an incredibly resourceful printer and an all around good man. So here it is, my interview with Carl Montford! 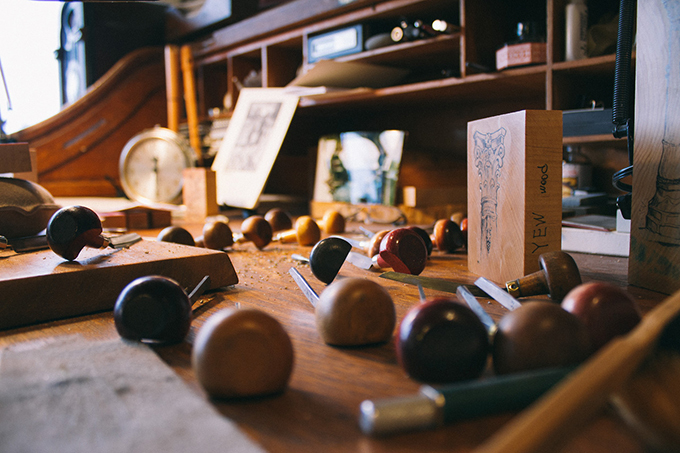 Q: What attracted you to wood engraving and letterpress printing after your career at Boeing? I didn’t start wood engraving and letterpress printing until just after I retired from 39 years at Boeing. I started my first ‘Montford Press’ in my garage in Wichita Kansas about 1970 or so. I wanted to further my ‘after hours’ endeavor in something creative, I have often said, I used this activity to maintain my sanity after dealing with supervisors and engineers all day…I like to think it worked. I was all self taught, both in letterpress printing and wood engraving. However, I fell in with a group of ‘old timers’ there in Wichita that were primarily collectors of letterpress equipment, save for one gentleman by the name of Bill Jackson, he taught graphics at the university and had his own private press in his garage also, except his space was insulated, (temps in that part of the country range from below zero to above 100 degrees). Bill didn’t teach me how to do things, but he inspired me no end. He created lovely books, all hand set type, lino cut illustrated and hand bound his own books, and all printed on an old style 8x12 Chandler and Price platen press. That inspired me to follow in his footsteps as much as possible. With the help of the local library, (way before the internet), I pursued wood engraving interests, both in examples and ‘how to’ books. I was a ‘closet wood engraver’ for many years, not knowing a single other active wood engraver for many years. After transferring to Seattle in the early 80’s and setting up my ‘Montford Press’ in my own home, (not in an uninsulated garage this time) I started amassing more type, presses and all the associated equipment. I joined the local BAG (Book Arts Guild) and found people of my own likes and interests, probably the main turning point of my artistic career. Shortly after that the internet started becoming popular, and I discovered an international group of wood engravers, the WEN (Wood Engravers Network), this linked me into a group of artists, both beginners and master engravers, and have been a member ever since. After retiring in July 1995, my interests in all this just exploded, having an additional 8 to 10 hours a day to devote to my passion of engraving and printing. After retiring, my connections with the BAG, WEN and in about 2000 getting linked up with SVC (School of Visual Concepts). I also teach out of my own studio, both in letterpress and engraving. Q: You've seen many aspiring printers come and go. What is your #1 piece of advice for someone who wants to learn about letterpress? I meet lots of people interested in letterpress printing via teaching and networking. I have helped many people find presses and type, taught them how to use it all, and watched it fizzle into unused rusting and corroded equipment. This is very disappointing to me after expended that much energy helping them. So, what I now look for in aspiring printers is REALLY being serious about it. Taking lessons first, actually producing something of worth THEN start looking for equipment. Inspiration, is an internal desire to achieve whatever creates a passion in the heart of an artist. I am lucky, I love nature, animals, birds and people for my inspiration in wood engraving subjects, but for my larger products of broadsides, I have several poets I’m in collaboration with, along with a couple of sister-in-laws that are all great poets, and keep me well supplied in inspiring words and images. Q: What's your favorite place to shop in Seattle? Where is my favorite shopping spot?...Dusty Strings in Fremont.